Enormous room in villa - Perfect 1 or 2 people to share. High ceilings, huge windows, a garden and a 40m room + 30m balcony with its own private bathroom & shower. 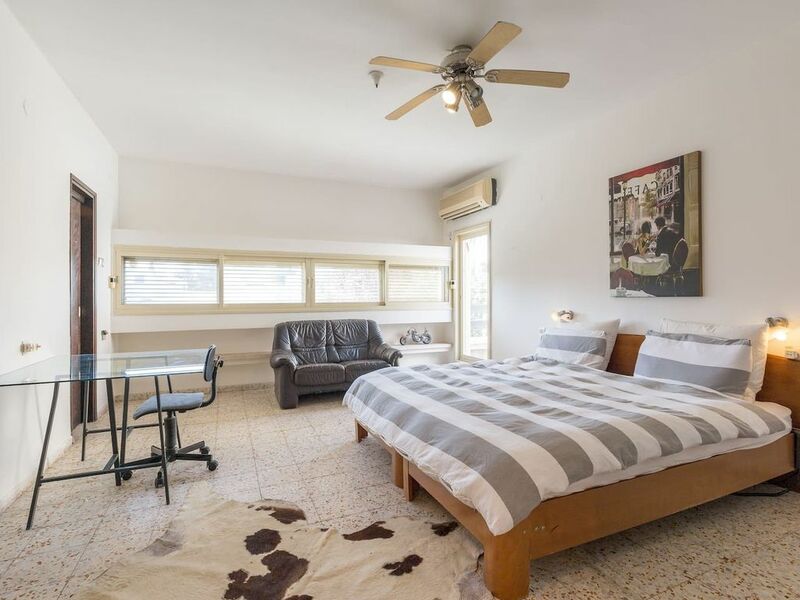 Close to Tel Aviv University & Beach. Convention center is also close by and easy to get to. Perfect for the first time to Israel. Welcome Home. Looking forward to hosting you. Privacy, Serenity and Security. Plenty of place to relax get way from it all while still being centrally located. A few blocks from the from Tel Aviv University and its fantastic sports center that includes three pools, two Jacuzzi's and a Sauna, full fitness, aerobics and free weights training - the best health club in the city (If not the country!). Prefer Beaches to the pool? 3-5 minute drive to the best non crowded beaches (by bicycle it is about 7-10 min. walking about 20-30 min. ), Cafe's, Sushi, Restaurants and the Ramat Aviv Mall, just down the block. Public transport to the city and the rest of the country are steps away even the train has a stop at the university. TV and Cable are only via blazing fast internet - but we even have Netflix on demand and are one of the only places in Israel that do. As for me? I am an MBA Graduate who works with Start-up companies to help them sell and export their products overseas. Short term and long term easy going fun loving happy people with a positive attitude are always welcome. The house has super high 3m ceilings - very spacious and airy feeling throughout. Lots of windows, light & great air conditioning.